NEW YORK, April 17, 2019 /PRNewswire/ — The Road to the World Car Awards journey concluded today with a grande finale awards ceremony and press conference that opened the New York International Auto Show. 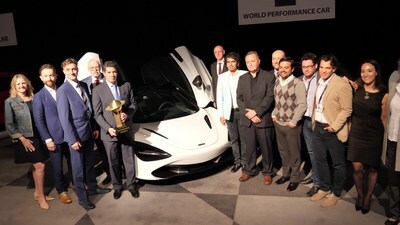 The McLaren 720S was declared the 2019 World Performance Car. The McLaren 720S was chosen from an initial entry list of six cars from all over the world then a short list of three finalists as announced in Geneva on March 5th. The 2019 Top Three in the World finalists are the Aston Martin Vantage, the McLaren 720S and the Mercedes-Benz AMG 4-door Coupe. Candidates eligible for World Performance Car must be produced in volumes of at least 2,000 units/year, must be overtly performance focused in nature, and must be available for sale on at least two continents during the period beginning January 1, 2018 and ending May 31, 2019. Previous World Performance Car winners were the BMW M5 (2018), the Porsche Boxster Cayman (2017), the Audi R8 Coupe (2016), the Mercedes-Benz AMG GT (2015), then three Porsche wins in a row: the 911 GTE in 2014, the Boxster/Cayman in 2013, and the 911 in 2012. Ferrari won the 2011 World Performance title for the 458 Italia while the Audi R8 V10 won in 2010, the Nissan GT-R in 2009, the Audi R8 in 2008, the Audi RS4 in 2007 and the Porsche Cayman S in 2006. World Car also made a stop at the Consumer Electronics Show (CES) in Las Vegas on January 10, 2019 where together World Car and ZF hosted a panel discussion moderated by Tim Stevens (Editor-in-Chief, CNET’S Roadshow and World Car director).